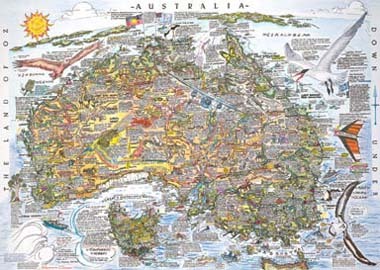 See closer sections of AussieMap - Australia Map - Here you will see his drawings in more detail. David E. Clarke - Artist mapmaker. Read how his early experiences as a Jackeroo & a fencer took him travelling and finally led him into the world of art. Aussie Links - If you are interested in linking to us - please get in touch - as we all know links are very important! Webdesign & Maps Copyright © 2006 Clarke-Ruff 'Aussiemap'.